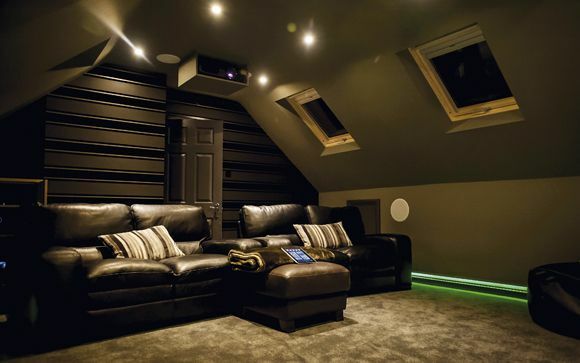 Can this £500 sounder really deliver virtual surround sound from a single enclosure? Anyone drawing up a mid-range/premium soundbar shortlist will no doubt be intrigued by Yamaha's YSP-1600. Selling for £500, it shares some of the DNA of the brand's higher-end models (the YSP-2500 and YSP-5600) but leaves more cash in the bank for Blu-rays. There are plenty of other prospect at this price, however, so can the soundbar do enough to make it an essential audition? Yamaha describes the design as 'slim', but I'd argue that's stretching the terminology a bit. The 6.5cm height didn't pose any problems for me in terms of blocking a TV's IR sensor, yet the design is boxy rather than curved or angular. It feels pretty solid, though, and there's a decent amount of space where the rear connections are to make source hookup easy. And it's relatively well-connected. An optical digital audio input provides a simple connection to a TV (and there's a cable bundled in the box), while a single 4K/HDCP 2.2 HDMI input is there for external devices. More would have been welcome considering the price. The adjacent HDMI output supports ARC. Further inputs are an analogue audio minijack, Ethernet port and a sub output. The latter is there because, unlike the costlier YSP-2500, this model ships without a subwoofer. Instead, the YSP-1600 mounts twin 3.25in bass drivers, rated at 30W-a-piece, at either end of its metre-long cabinet. Centrally positioned, and front-facing, are eight 1.1in beam drivers. Wi-Fi and Bluetooth are built in, making the soundbar a decent music playback alternative. Indeed, another bonus feature of the YSP-1600 is its integration into Yamaha's MusicCast multiroom eco-system. Essentially, the means the 'bar doubles up as a zone speaker in a MusicCast setup, drawing from additional sources including Spotify Connect and AirPlay. I began by connecting the YSP-1600 via optical to a Samsung TV, and fed it a Sky HD showing of the long-forgotten Vin Diesel sci-fi Babylon AD. I was rewarded with an enthusiastic and relatively dynamic sound. Diesel's gruff dialogue was well-projected and resonant. Meanwhile, the packed locales of the dystopian future Manhattan buzzed with detail effects. The sounds of Diesel chopping up and pan-frying a rabbit in red wine made me hungry. High-frequencies are crisp, bordering on bright. With the Blu-ray of Ridley Scott's The Martian via HDMI, the impressive low-end punch of the YSP-1600 came to the fore. There's a nicely rounded nature to the Yamaha's bass, and it mixes with the higher frequencies well, as opposed to some systems where the separate bar and woofer can sound like distant cousins. The frequency response is rated down to 50Hz, which isn't monstrously low, but I'd suggest only those stepping down from a dedicated woofer will feel short-changed; there's enough depth here to lend cinematic impact to the stranded astronaut's endeavours, and a whole load more than whatever your flatscreen TV is proffering. When the MAV conducts its rocket-powered takeoff, the Yamaha has sufficient grunt to capture the scale of the event. At the left-side of the soundbar's fascia is a bank of green-glowing status LEDs. These provide an overview of what the bar is doing – e.g. whack up the volume and they flash in sequence left-to-right – but I doubt you'll remember which individual one represents which source. It's easier to hit the button on the handset to make sure. Also on the zapper are a subwoofer level adjustment, and keys for the YSP-1600's sound presets. These are Movies, Music, Game, Sports and TV Program. The Music setting is the most aggressive, imparting an echoey, phasey quality that's presumably meant to simulate a live performance. With music it's a bit odd; use it with TV or film material and it's unpleasant (hi-fi purists can opt to run the soundbar in straight stereo). Differences between the others are more subtle. I was happy to leave it on Movie. With the soundbar connected via HDMI you can call up an onscreen display. This makes tweaking easier than using the handset, but the interface is still achingly old-fashioned. In terms of output, this Yamaha hits the mark. I found it could be pushed without fear, retaining its balance and clarity as the volume creeps higher. The Martian's repetitive score finds the YSP-1600 offering decent mid-range presence, although it's not the most musically-minded performer out there. Barb Jungr's easy-on-the-ear Dylan cover Sara (SACD, Linn Records) enjoyed a robust bottom end but needed more subtlety in the vocals and piano. Regarding the 'bar's surround sound ambitions, I'd warn buyers to dampen their expectations. While the YSP-2500 and YSP-5600 pack 16 and 44 beam drivers respectively, this unit offers eight, thus giving Yamaha's time-/direction- controlling DSP less to work with. Furthermore, there's no IntelliBeam automatic room analysis here to help you out. Installation is more prosaic – you place the bar and see what happens, making use of three settings (Left, Centre, Right) depending on whereabouts along your front wall the YSP-1600 is installed. And you'll need side and rear walls to bounce the bar's soundbeams – corner placement is a no go – and pay heed to Yamaha's room dimension requirements (e.g. no ceiling higher than 11.5ft). There's a channel level adjustment that is handy here, as you can use it to isolate the surround left/right channels to get a sense of where they are coming from. And having control over the centre channel is useful if you want to give dialogue a bump. So, does it work? Well, I never got it delivering a wraparound performance I was entirely satisfied with, even after studious placement, but there's certainly an immersive soundfield here, as opposed to the experience of merely being shouted at by a box at the other end of the room. During the Matt Damon sci-fi, I was routinely surprised by the YSP-1600's ability to place me amidst the swirling dust of the Martian storms, or to place effects with pleasing precision (such as a warning alarm that beeped insistently behind my left ear). However, sequences that feature really specific audio pans weren't its forte. In the guinea-pigs-as-spies kids' caper G-Force, a maelstrom of tumbling coffee beans, as the heroic rodents try to escape a pet shop, teases directionality, but is more diffuse than direct. It made for an interesting comparison with Sony's HT-RT5 tested previously: that model's use of physical surrounds is more effective. But, obviously, more of an installation faff. This doesn't mark the YSP-1600 down as a lost cause, though. Far from it, in fact. This is an enjoyable listen, multiroom-ready, with a beefy and detailed output that'll easily rustle up thrills come movie night and works reasonably well with music. Some systems may come unstuck by the meagre HDMI connectivity, though.